Graig says "I thought about blowing everyone's game up but I'm not going to"
9:30am Big Brother wakes up the house guests. Big Brother blocks the feeds and when they come back Pilar asks what Big Brother said. Bobby tells her they said be prepared to be called into the diary room. He tells her for everyone to do their goodbye speeches. “I know you’re going home..” Bobby heads to the bedroom to pack his things. Willow and Zach hangout beside the bathroom. Willow says this is my last day I’m sure I’ll be a havenot tomorrow. She says there’s 5 of us that haven’t been a havenot. She asks him do you want to win HOH? Zach says yeah. Willow says hopefully your thing is beneficial. (Zach won an advantage in the HOH competition tonight.) Zach says yeah. She talks about how Pilar tried to sleep in the havenot room and was told she has her own bed. Up in the HOH room – Brittnee is packing up her things. Sarah and Willow are also in the HOH bathroom brushing their teeth and getting ready for the day. Willow is excited when she finds her underwear in the HOH bathroom. She tells Sarah when you fold your underwear like this it apparently mean you just got laid. In the storage room – Bruno tells Jordan about how 3 years ago he was number 1 in the world for the game Dark Age of Camelot. Jordan is impressed. Bruno says that was my only secret and I figured I would tell you just in case it comes up and gives you an advantage. 10:30am – 10:55am In the bedroom – Willow talks to Graig. He tells her that he thought about blowing everyone’s game up but says he’s not going to do that. She tells him to hang in there because you never know if you might get a chance to come back into the game. Graig says I don’t know, I don’t know about that. Graig says he’s done with this whole thing. They talk about hanging out after the show is over. Graig sits on the bed staring at the mirror. Willow heads to the kitchen and tells Bruno and Bobby that she talked to Graig and he’s good. She says at first he thought about blowing us up but said he won’t. He’s ready for this to be over. Bobby says I don’t even know what to say to him. 11:10am In the bathroom – Johnny notices that the middle sink is leaking water all over the counter and floor even though the tap is turned off. He tells big brother a number of times and then tries to get into the diary room to notify them. Ashleigh helps put towels around the tap to stop the water. 11:20am – 11:30am Up in the HOH room – Johnny is talking to Brittnee. He says that he knows if he doesn’t win HOH he will be going up on the block. Britt says we need one of us to win it. Use that fire inside you to pull it out. That’s how we did it. (Her and Sarah) Johnny says I will, we will win HOH! Brittnee says I hope this advantage helps us (Hexagon alliance – Sarah, Britt, Johnny, Zach, Jordan, Kevin) pull it out. (Zach’s HOH advantage) They talk about how how they wouldn’t be surprised if tonight was a double eviction. Britt says just don’t play this game with fear. Johnny says I don’t want this experience to end. I want to be here and to make it to the end. Britt says I think we have a strong solid group. Britt says you have at least 4 votes. Johnny says not really, it depends on who I’m sitting next to. Britt says that Willow said Graig is over with this. I think he knows what’s up. Johnny says I don’t think he is going to get any votes. Bruno even asked Graig to reach out to his wife. Johnny says they’re all working together.. Bruno, Bobby, Godfrey, G .. and I hate to say it but Willow is with them too. 11:30am – 11:55am Big Brother tells all the house guests to go to the head of household room for a lock down. All the house guests pile into the HOH room. A few try to nap and big brother tells them nap time is over. Willow talks about how her cat has had 36 litters. They ask her how many kittens in each litter? Willow says one had 9, 8, 8, etc. Jordan says so you’re a cat lady Willow? Willow says yeah. She says her cat first got pregnant at 12 in human years. In the bathroom – Jordan talks to Bruno about the game Dark Age of Camelot and other games. 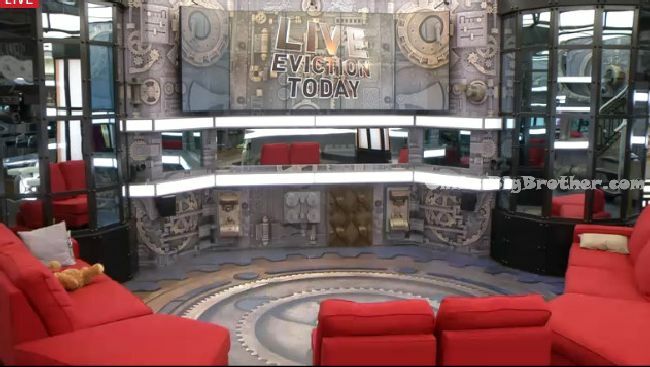 11:56am Big Brother blocks the live feeds. 3pm The live feeds are still blocked..
4:10pm The live feeds are blocked until after the eviction episode airs..
“put this heavy bag around the HG / few HGs of your choosing (Survivor style)”. He could say Jordan since they’re together and jordan wants to throw it anyway. How would he explain this to the Hexagon? They’ve been saying “one of us needs to win this” for days, they expect him to want Jordan (if not himself) to win the HOH. If I were him I would choose Jordan too, bc even though the Hexagon or Snakes or whatever would be like “why did you do that”, Zach can BS something. He’s no one’s target, and he and jordan can be convincing enough to the alliance. Smart move would be for him to pick Kevin if that’s the case, since Kevin is wanting to throw HoH with Zach and Jordan and Zach could say Jordan has been great at comps. Wish big brother would just evict Willow. What if he simply eliminated Jordan? Team Deluded- It's the fortress, baby! Eliminating Jordan will make “The Hexagon” super suspicious. Eliminating Pilar will make him stand out as “playing the middle”, in the eyes of both the chop shop and hexagon. So nominating Pilar and only 1 “approved target” (Godfrey?) would be very suspicious to the Hexagon, while nominating none of the Chop Shop targets he’s been talking about would be declaring war to the chop shop. imo he can’t actually eliminate anyone from the contest. godfrey: men get suspicious especially Bruno. this is the problem with having an alliance with every member of the house. Can someone explain this HOH advantage that Zach has? I haven’t heard on the feeds yet, I’m pretty sure Zach doesn’t know yet either. I hope Zach does win the HOH and some of these alliances start blowing up. but basically they are banking on his athleticism to win stuff, but that is usually a mistake. Sarah and Brittnee won what is a fairly physical comp that Z & his partner should have easily mastered over those two. there was no indication they wilingly fell off or that he did anything to manufacture that. He could easily still have not been HOH by letting his partner be HOH. Newport’s big error: playing the middle doesn’t mean having separate alliances with every single member of the house. I mean, Zach is even contemplating an alliance with godfrey, isn’t he? if you are in a separate alliance with everyone, risk of exposure increases post veto weekly. secondary error: Jordan has been overexposing his memory and intelligence to the house. Zach has already overexposed his aim (their ball and bowl games). if either memory or aim-based are the hoh comp, and Zach already has an advantage, throwing this comp will set off everyone’s radar. maybe things will actually get interesting after all, because I’ve had enough of the mustache twisting and back patting. it will end up being worse for Zach because more people will be upset he is playing with B/S/J side of the house.. Jordan doesn’t have that. I wonder if Jordan is aware if everything blows up he may be more safe than Zach? i’m sure Jordan is completely aware that if they are exposed, Zach will be the bigger target. I think that was the secondary reason for wanting a brawny person as his ally. if they are exposed, the brawn will be seen as a greater threat. hey scott, yes they already know he’s a qb. but, he’s also been playing basketball and bowling with the other hg’s. being good at one doesn’t translate as necessarily being good at others, but he’s showing he’s proficient in multiple games. if it is any kind of sport theme game, how can he explain throwing it with an advantage. I’m hoping with every fiber of my being that Zach and Jordan expose their Newport Alliance and how they really feel in their goodbye videos to Graig! Then I hope that Graig wins the chance to come back into the house and THEN blows up their game! THAT would make this season worth the torturous boredom! Only issue with that is since the first five evicted get a chance to return, they don’t get to see any goodbye messages. Had to Thumbs Up your reply because you’re dead right! Forgot about that! Oh well, it would have been great! Thanks, Blake. Most of them do and it’s because Big Brother gives them things to say. Pilar confirmed it earlier. As soon as she said so, the feeds were cut. She WAS reading from a script haha all the DR’s are scripted! Pili and Ash look soooo bomb! I just wanted to back up a point I made earlier. For those who have never seen Big Brother Australia, here’s a link to watch the Launch Night of the best season of any Big Brother ever, especially the finale! It’s from 2012. The link takes you to NovaMov to watch it. If you don’t have AdBlock Plus or Adblock Edge installed, you may have to close out a few pop-up ads. The site is safe and I don’t own it or get any compensation if you watch it. I just want to hear what people think when they compare the Aussie version to the Canadian or US versions. The Aussies have a phenomenal house but not as elaborate competitions. Big Brother himself is a HOOT! If Simon and Dawg covered spoilers for BBAU, it would be a match made in heaven for me! If you watch this launch night and want to see the rest, let me know and I’ll show you where you can watch it for free. (I REALLY hope this is okay Simon and Dawg. No harm or anything else intended. Just trying to share the BB love! The BBAUs & BBUKs are on youtube as well. They are just different shows, you can’t prove one is better than the other. It’s a matter of personal preference. More Strategy vs More Social. BBCAN is bringing a bit more of the viewer participation in to the game, so that should make you happy. If there’s going to be interference in the game, it’s better that viewers decide instead of production doing it, and worse pretending it’s not happening. BBAU and BBUK, as fun as they are, don’t have live feeds any more and that is a big downside because, as we all know, livefeeds are crack! But it also allows production to sanitize anything controversial, create dramas and showmances that aren’t real, and help players they want to keep in, all with the edit. Then you have to wait to hear from the players coming out what’s really going on inside. I enjoy BBAU and BBUS but prefer BBUS and BBCAN because of the livefeeds and the strategy game. Yes, BBAU was especially good in 2013, when Tim was able to make it a more of a game. But what about last summer? Ryan was a very disappointing winner. That’s the problem with a popularity contest show, you will have years where the cutest/nicest will win. Again personal preference, but that’s just not what I’m looking for in a winner. BBAU and BBUK have a lot of year’s like that. BBCAN and BBUS versions have good years and bad years too, but for me that happens less often in this version. There is an actual game going on, so whether my first picks/favs do well or not, it’s fun to watch and see player’s fortunes change. If you don’t enjoy the strategy game, you’re won’t like these versions as much. Also don’t forget the crack! Of course it’s personal preference. But I highly disagree with you about audience participation. There’s a LOT more of it in the UK and AU versions because the audience gets to vote for a lot more, including WHO gets evicted. Housemates nominate but the AUDIENCE sends them packing. In the US version, the audience has absolutely no power in the game. Sorry, but deciding what food to give the Have Nots with their slop is just not participation. The reason I like the UK and AU versions better is because they’re more about WHO YOU ARE as a person instead of how well you can BACKSTAB, LIE, and MANIPULATE people. I’m currently watching BBAU 2008. It’s really irresponsible that Willow’s cat has had so many litters. There are so many stray animals both on the streets and shelters, everyone should spay and neuter their animals. Where can I watch tonight’s episode online? Sorry if this has been answered elsewhere! LOL I wish there was something to report … but the feeds have been blocked since this morning and we haven’t even gotten a leak of the HOH comp or of a maintenance man. Watching the episode now. They’re really editing Graig to make it look like he fought to stay in. Guess him sitting in bed moping for 2 days didn’t make for very good tv!